They conjure images of hideous, brooding creatures perched high above the cities and villages of the world. The most terrifying ones look as though they might break from their stone moorings and take flight. But gargoyles, it turns out, are full of surprises. Read on to learn the origin of their name, their very functional purpose, and what makes a gargoyle different from a grotesque. 1. THEY SERVE A PRACTICAL PURPOSE. 2. THE NAME COMES FROM A DRAGON-SLAYING LEGEND. The word gargoyle derives from the French gargouille, meaning "throat." This would appear to take its inspiration from the statues' water-siphoning gullets, but in fact the name comes from the French legend of "La Gargouille," a fearsome dragon that terrorized the inhabitants of the town of Rouen. For centuries, according to the story, the dragon swallowed up ships and flooded the town, until around 600 BCE, when a priest named Romanus came along and agreed to vanquish the beast in exchange for the townspeople's conversion to Christianity. Romanus tamed the dragon by making the sign of the cross, then led it into town where it was burned at the stake. The creature’s head, however, wouldn’t burn, so the townspeople cut it off and affixed it to their church. The gargouille’s head became a ward against evil and a warning to other dragons. 3. THEY WERE MEANT TO INSPIRE FEAR IN PARISHIONERS. 4. THEY ALSO BROUGHT PAGANS TO CHURCH. 5. THEY DATE BACK TO ANCIENT EGYPT. Although the name gargoyle dates back just a few centuries, the practice of crafting decorative, animal-themed drain spouts reaches back several millennia. The ancient Egyptians had a thing for lions, as did the Romans and the Greeks. The oldest gargoyle-like creation is a 13,000-year-old stone crocodile discovered in Turkey. 6. 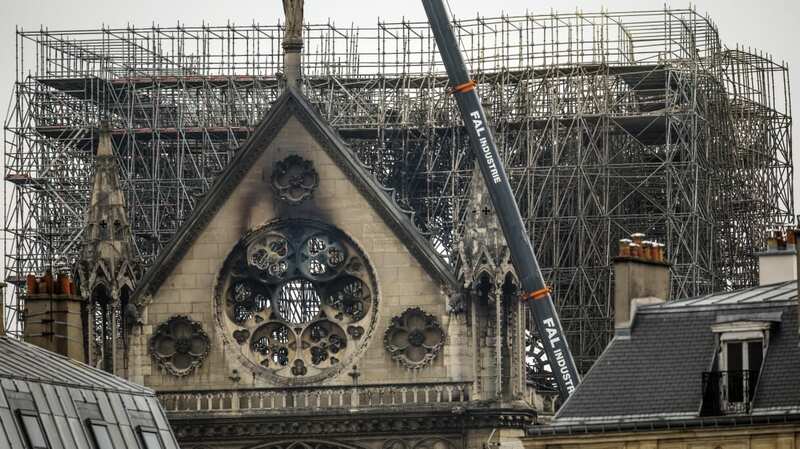 NOTRE DAME'S GARGOYLES ARE FAIRLY RECENT CREATIONS. 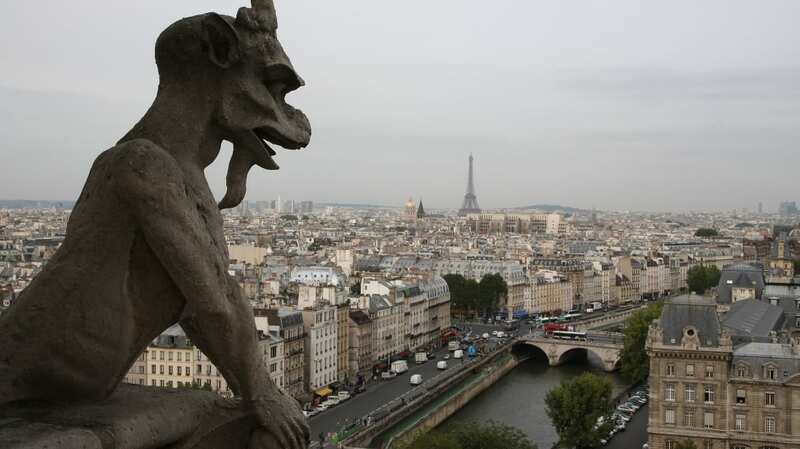 The world’s most famous gargoyles, and the ones that most influenced the popular wings-and-horns image of the creatures, are found on Paris’s Notre Dame Cathedral. Although the cathedral was constructed in the 13th century, the gargoyles were part of an extensive restoration project in the mid 1800s. Conceived by architect Eugène Viollet-le-Duc and sculptor Victor Pyanet, the gargoyles have little in common with Medieval gargoyles, scholars contend, and were intended to represent the time period rather than recreate it. 7. PITTSBURGH IS A HOTBED FOR GARGOYLES. In the 19th century, the Steel City embraced the Gothic architecture revival that swept across America. Many of its Gothic churches, government buildings, and other edifices remain, along with their iconic gargoyles. All told, Pittsburgh features more than 20 authentic gargoyles, and hundreds of grotesques. Many of them are featured in the city's "Downtown Dragons" tour run by the History and Landmarks Foundation. 8. SOME WERE FASHIONED AFTER BUILDERS AND CHURCH ELDERS. Cologne Cathedral in Germany features a gargoyle fashioned after the church’s longest-serving council member, while at the Cathedrale Saint Jean in Lyon, France you can see a gargoyle modeled after the building’s renovation construction manager, Ahmed Benzizine. Because nothing says "thank you" like a hideous stone creature carved in your likeness. 9. 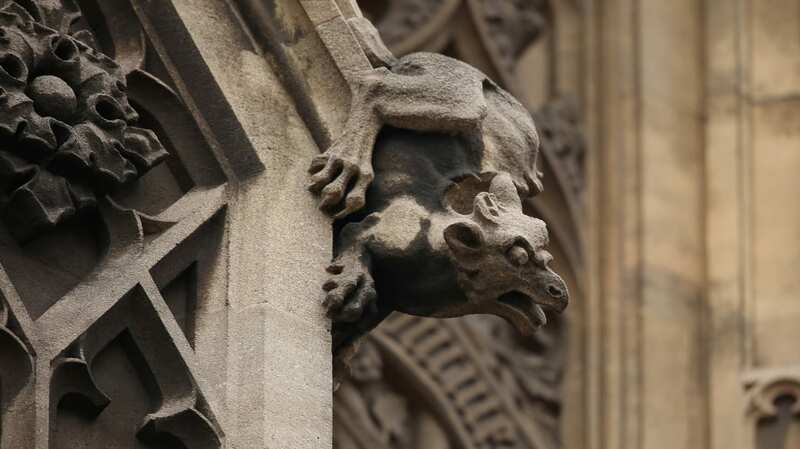 A FRENCH CATHEDRAL SWAPPED ITS GARGOYLES FOR "GREMLINS." During the restoration of Chapel of Bethlehem back in the early '90s, sculptor Jean-Louis Boistel decided to replace the building’s crumbling gargoyles with a few pop-culture icons. This included Gizmo and a gremlin from the movie Gremlins, an Alien xenomorph, and a robot from the popular anime UFO Robot Grendizer. Many locals were put off by Boistel’s creations, which are technically grotesques, but enough young movie fans got behind the "geek chapel" idea to get it approved. 10. THERE'S A DARTH VADER GARGOYLE IN WASHINGTON D.C.
Back in the '80s, the Washington National Cathedral held a contest for kids to design its newest gargoyle. Coming on the heels of the Star Wars trilogy, of course someone proposed a Darth Vader gargoyle. The cathedral, which had already installed some off-the-wall gargoyles and grotesques during its extensive restoration work, named 13-year-old Christopher Rader's design as one of its winners, and in 1986 put Lord Vader high up on the cathedral’s "dark side" north wall. It can be difficult to spot, but the cathedral offers this handy guide.